I know Easter was yesterday. But let’s not leave the scene so quickly. 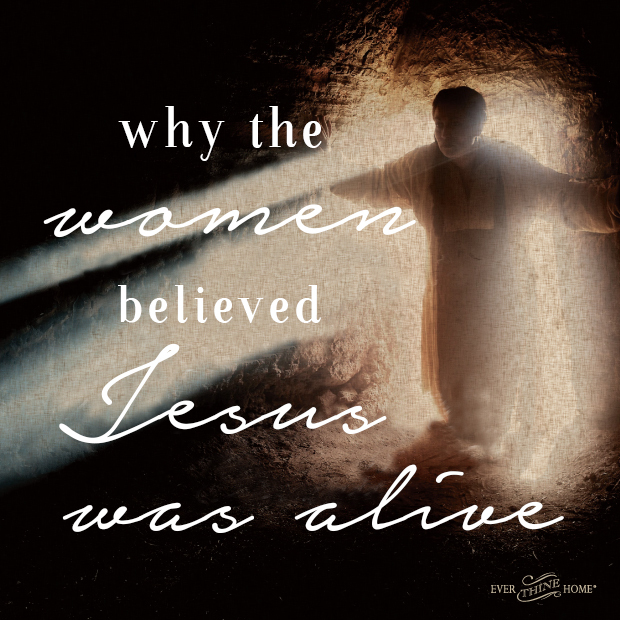 Questions linger, specifically about all the women who were at the tomb at first light. Without a doubt, Mary Magdalene was present. All four gospel authors include her. Also noted by the Spirit-inspired pen were: Mary, the mother of James; the other Mary; Salome; Joanna; and more other women. Why were there no men? What had God created specifically in women that drove these six or more that Sunday morning to be near Jesus, to desire to anoint His body, which is obviously an expression of deep love? Mark records, “That they might anoint Him, very early on the first day of the week” (Mark 16:1-2). Because of their quicker to believe faith, these women were the very first to know that Jesus was alive! They also had the privilege of seeing and conversing with the angel in the tomb. This is not a bashing of the male disciples. It is merely another kind of marveling at the mysterious handiwork of God to create in us women a uniquely different capacity for belief. 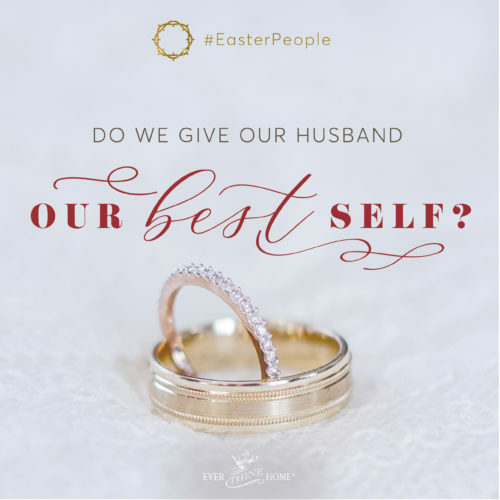 Though women in Jesus’ day were often viewed as inferior to men, Jesus knew differently. 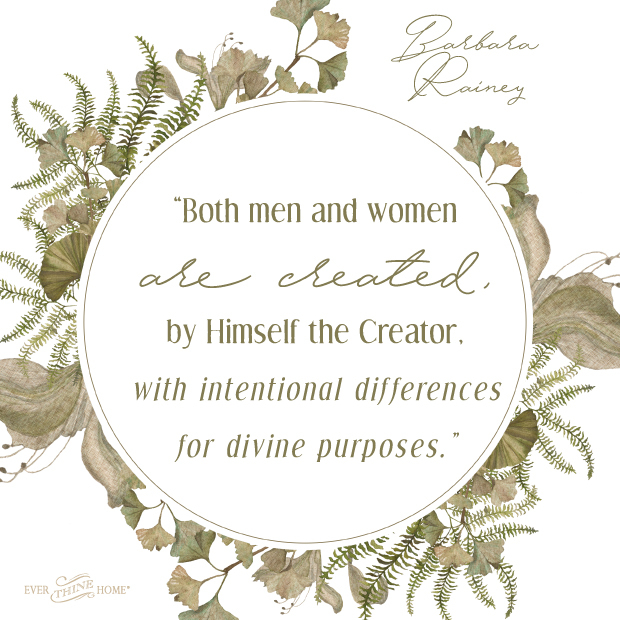 He knew both men and women are created, by Himself the Creator, with intentional differences for divine purposes. Here at the tomb we see Jesus honor His female disciples who were quick to recognize and believe the impossible. He gave them the first sighting of His resurrected life! “He first appeared to Mary Magdalene,” (Mark 16:9). Their eager, welcoming faith was abundantly rewarded. After hearing the women’s unbelievable report, only two men were curious enough to run and see for themselves. Peter and John hurried to the tomb. John “saw and believed,” he wrote in John 20:8. Later, Jesus rebuked the other disciples as group for not believing the report of these faithful women. “He reproached them for their unbelief” (Mark 16:14). What can we learn from this? It is recorded for a reason. But being proud or condescending is not the reason. Let’s start by rejoicing that all who believe have been granted eternal life because of Jesus’ sacrifice. From there, let us give thanks for His providential creative genius in making us male and female. It is another marvel from the first Easter. The women responded uniquely and it is good. On Monday morning at the temple crisis management was still in full swing as the unexpected “apparent” resurrection, or disappearance, of Jesus had not yet been resolved. The religious leaders, Pharisees, elders and priests, had spent much of the previous three years trying to discredit and trap this Man so they could get rid of Him. Once He was on the cross that Good Friday morning, they were greatly relieved. 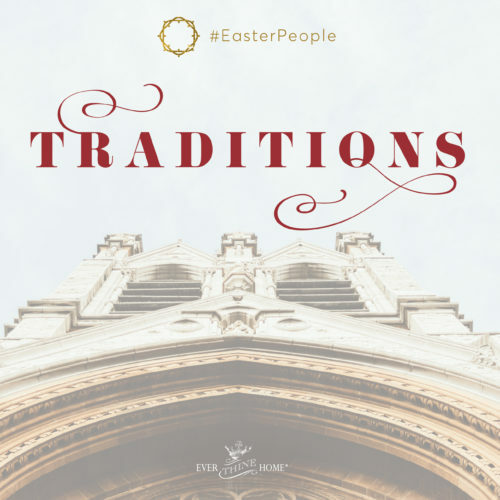 The comfort of centuries old traditions gave them peace as they returned to the task at hand: performing their Passover duties in the temple. But their peace was short lived. 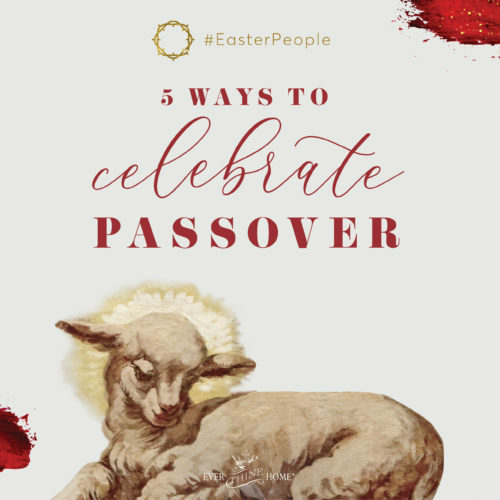 To their shock, their toil of killing Passover lambs was dramatically interrupted on Good Friday afternoon as invisible hands ripped the massive curtain that separated the Holy of Holies from the rest of the temple. It happened at precisely 3 o’clock in the afternoon when Jesus breathed His last. The thunderous ripping sound echoed from every wall. -Was the curtain hanging on each side by a few unbroken rings or was the entire tapestry lying in two great crimson puddles on the floor? It surely remained so on Monday morning. -Did the tradition-soaked priests frantically attempt to cover the opening as if God were suddenly naked before them? A curtain so large, so heavy couldn’t have been repaired and rehung quickly. Seeing this holy room open surely was deeply disturbing to them. -Did anyone make the association with the naked Jesus, His back shredded like fabric, hanging limply from two rods on either side of the cross? -What did these illustrious men who lived for perfectionistic control think, feel, and fear as they undoubtedly replayed the experience over and over in their minds in the two days since it happened? And now rumors were flying that this Jesus was alive and being seen by His disciples! Jesus had escaped their calculated plans to make Him disappear. I think I understand some of what the religious leaders felt. Jesus has disrupted my world more times than I would have liked. Managing the crisis is a natural response when one thinks he is in control. But we are not in control. Just as they were not. The central message of the cross is all about the control of the One whose Love is supreme. This perfect plan of redemption is supported by a cast of thousands of details each giving ascent to the infinitely perfect plan of the Father, executed flawlessly by the Son. God’s Spirit left the temple during the days of Ezekiel and by Jesus’ sacrifice the way was permanently opened, symbolized by the torn curtain, for anyone to come before God’s throne. May you continue to marvel this week at the Greatest Story ever told. And may you give thanks repeatedly every day for the wonder of salvation! I didn’t read this until Tuesday morning. Timely as right now my heart battles as I’m being asked to yield my will for God’s in a very painful way. My heart aches and finds comfort in your words. Thank you. Yesterday, we hosted our Resurrection Party. Thank you so much for for this blog today-& in the past. Kristy — We would love to see pictures and hear more about your party! Would you email us? Yes, & thank you for asking. After church responsibilities, I did snap at Andy… I quess I got stressed out about hosting a party & with three little kids around… He took me aside & prayed with me. A few moments later, Andy said, “honey-Barbara Rainey would be proud of you.” It reminded me of a lot of what I had been listening to on F.L. & I hope others feel the same encouragement that we do from your ministry to elevate Easter!! His love is far beyond my comprehension, I always try to grapple with understanding it but I fail especially not having experienced much love from humans. And I understand why the Bible says what it cannot be fully known. I’m so glad you mentioned the torn curtain! I’ve wondered what the priest’s reaction was. Noone but the high priest was allowed in and then only once a year. And even now that there is no temple, no ark, no way for Jews to celebrate feasts and sacrifice because their Messiah has come and a new covenant has been made. It’s puzzling to me how they cannot believe that Jesus is their Messiah. Lot’s to ponder. Thanks for the post! I’ve wondered about the veil..what was their response? How did they explain it away? Did any of them look again at what they had done, their hatred of Jesus? Did their hands/faces grow cold and clammy? Hearts beat fast? Did any join Joseph of A- in his belief? God specifically directed the construction of the veil–He didn’t direct the repair/reconstruction of it…How did they handle it? so many details not given, but the most important is there CHRIST IS RISEN, INDEED HE IS!! Thank you LORD..
My heart so often skips a beat (or more!) when others (or in my reading) help me to go deeper, look and think more, listen to God’s whispering or His thunder or His pointing out parallels…. HE IS SO UTTERLY AMAZING! Thank you, deeply and humbly, for pointing me to the truth of that one and only Friday, Saturday, Sunday, and on, that will never happen again. I desire to read this truth over and over as I am His and He is mine. Thanks be to God and you!